The Chiefs new Head Coach Andy Reid figures to provide an offense the Chiefs have been missing for the past two years. of the Kansas City Chiefs, the 2012 year couldn’t end fast enough. The team had just struggled through a 2-14 season which was one of the worst in the history of a proud franchise. From all the losing to a suicide in front of Head Coach Romeo Crennel, all they could do was start from scratch. 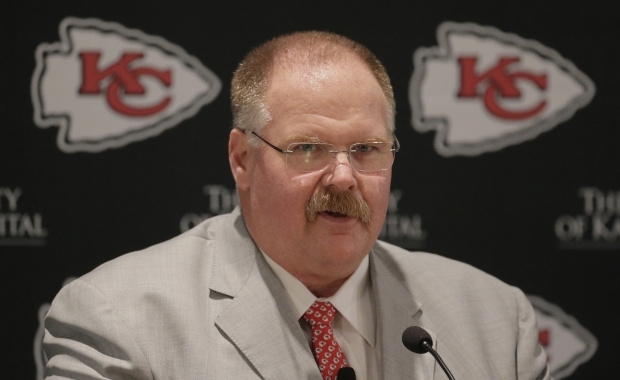 Enter new Head Coach Andy Reid. Whenever a team hires in a new coach, the optimism of a franchise is renewed. Yet why this much optimism?? The staple of the Andy Reid era in Philadelphia was his quarterback development. We’re not just talking Donovan McNabb, think back to the 2002 NFL season. In that year he coached AJ Feeley and Ty Detmer to a 5-1 record while McNabb recovered from a fractured ankle. That year they made the NFC Championship Game. In 2006 he coached an aging Jeff Garcia to a 5-1 record when McNabb was lost for the season and they made the playoffs winning a wild card game. 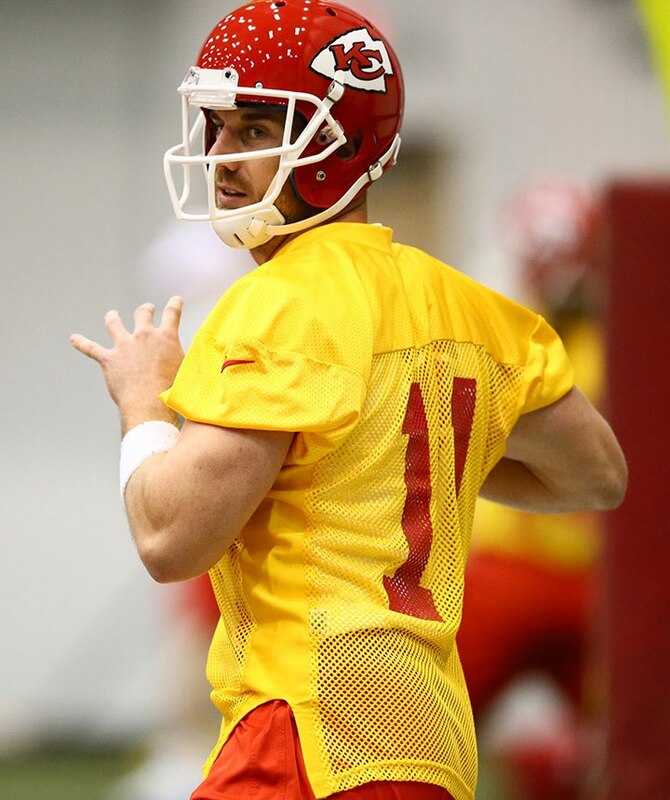 Alex Smith for the first time in his career doesn’t have to look over his shoulder. The Chiefs are committed to him. Quarterback: What is strange about the odyssey Alex Smith has led is how easily he was dismissed. It’s been documented how he had six offensive coordinators in seven years however before he was traded he had turned a corner. Although his former 49er team made it to the Super Bowl with Colin Kaepernick under center, he was 19-5-1 in the last two years. His play had matured while he ran a play action offense that played to his strengths. For 2012, A. Smith completed 70% of his passes for 1,737 yards 13 TDs with 5 interceptions vs 62.4% for 1,814 yards 10 TDs and 3 interceptions for Kaepernick. An uneducated fan will say “Yes, but they made the Super Bowl with Kaepernick” which is true but a total misnomer. They were already on their way there. In 2011, totally under Smith’s control, they were 13-3 and lost in overtime in the NFC Championship Game. In that game he did not throw an interception. The same could not be said for the 11-4-1 49ers that played in Super Bowl XLVII as Kaepernick did throw a 2nd quarter interception that held up comeback efforts. For the first time in his career he is going to have big play receivers in their prime. Dewayne Bowe was re-signed and last year’s top pick Jonathon Baldwin are big targets. Face it, Michael Crabtree finally panned out last year. He was on his way to bust status that even the most ardent 49er fan would care to admit. All Smith has to do is produce a little offense and this team could win. Did you know this team only scored 423 points in the last two seasons combined?? Over the past two seasons, Chiefs quarterbacks threw for only 21 touchdowns as compared to Smith’s 31 in a season and a half. What does that mean?? Well during an 8 game stretch after beating New Orleans in overtime last year, the Chiefs lost 4 of those 8 games by 10 points or less. If you factor in those 10 additional touchdowns of Smith v. Cassel and Brady Quinn this team could have had a 6-5 record going into week 12 instead of a demoralized 1-11. He was a winning quarterback when he had a running game when we last saw him and he should be playoff caliber this year for Kansas City. Why not just average?? Andy Reid is a quarterback coach and they play the 5th easiest schedule. Only a .473 winning percentage. Add to that there is little to study of Smith in a true West Coast offense. Do you realize Jamaal Charles has rushed for over 1,000 yards 3 times in a 5 year career?? Offensive Backfield: The saving grace for the Chiefs offense last year was former Texas Longhorn Jamaal Charles. Last year he ran with enough power to break tackles and have a Pro Bowl season with 1,509 yards. He had a whopping 5.3 yard average and don’t forget he was a Pro Bowl performer in 2010, when he rushed for 1,467 yards and an even better 6.4 yard average. This is no fluke. He’s only going into his sixth season and Reid hasn’t had a running back of this quality in any of his years in Philadelphia. Add to that when Charles is spelled, the even quicker Dexter McCluster is the out of the backfield pass receiving complement. These two combined are Brian Westbrook 4.0. Last year he pitched in with 52 receptions for 452 yards and 1 touchdown. He can help with first downs between the 20’s. Charles also contributed with 35 receptions for 236 yards and a touchdown as a safety valve. For battering at the goal line or short yardage situations, we have to see if Peyton Hillis will do it. Or if Reid will have Charles follow a FB into the line. This group needs more touchdowns. This group should be productive to a Super Bowl quality grade. You have to believe Reid promised to get Bowe the football. He re-signed pretty quick in Kansas City. Receivers: Here is where Andy Reid will feel like an adopted kid spending his first Christmas with a new family. So many toys he won’t know which to play with first. 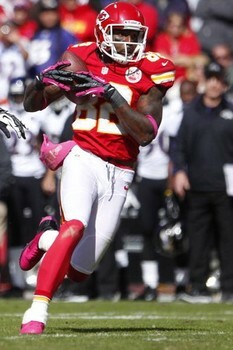 Before they acquired Smith, the first priority was to re-sign WR Dewayne Bowe. At 6’3, 230 lbs, Bowe is a muscular receiver that will go over the middle. He isn’t a burner and he can be an X or a Z in Reid’s offense. He’s not the most fluid in the hips and will most likely line up as the X. Nevertheless, he caught 59 passes last year for 801 yards and just 3 touchdowns. Expect these numbers to go up in a better structured offense. New Wide Receiver Coach David Culley, your mission should you choose to accept it, is to further develop second year receiver Jonathon Baldwin. The 6’4, 225 lbs former Biletnikoff Award winning receiver from Pitt had a modest rookie season. In 6 starts he caught 20 passes for 325 yards and a touchdown. Promising is the fact that he averaged 16.3 yards per reception. This will be the break-out year for Baldwin and the offense as a whole will take off. No secondary in the AFC West will be equipped to cover them. 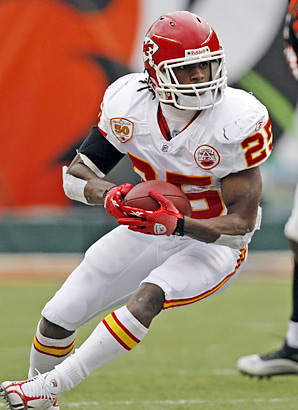 Chiefs brass has also signed free agent receivers Mardy Gilyard and Donald Avery to challenge for the slot positions. At tight end Anthony Fasano was signed as a free agent and Travis Kelce was drafted in the 3rd round. Incumbent TE Tony Moeaki (33 rec./ 453 yds / 1TD) had better be ready for the challenge and pick up this offense quickly or he will be the odd man out. A playoff caliber group. 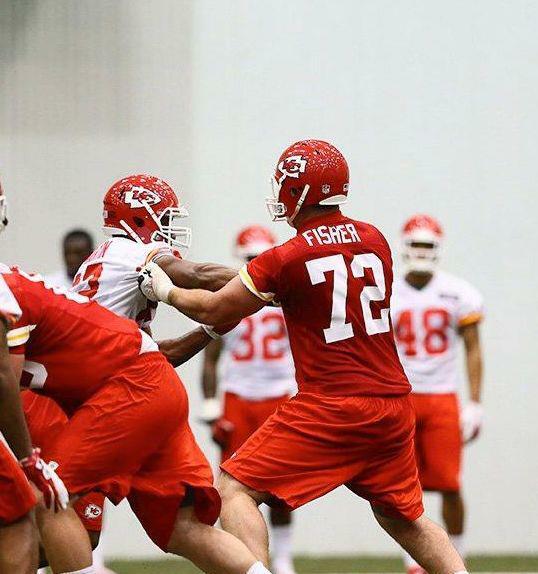 Top draft pick Eric Fisher at rookie camp. Its imperative that the line comes to camp healthy and ready to compete. Offensive Line: One of the places the team is looking to improve is on the offensive line. Here the Chiefs have drafted T Eric Fisher with the first pick of the draft. Then went on to select Eric Kush in the 6th round while designating T Branden Albert the team’s franchise player. To add to the mix the Chiefs have another six offensive linemen signed and will be brought to camp. With draft pick Kush already signed, the priority is to get Fisher into camp on time. Are the Chiefs making wholesale replacements on a line that gave up 40 sacks or are they making moves to fit Reid’s style of offense?? Either way we have to give this group an incomplete until we know who is starting and where. Even Tackle Eric Winston, a starter in all 16 games last year, was released. Defensive Line: After being burnt by the drafting of former LSU DT Glenn Dorsey, the Chiefs didn’t draft any defensive linemen even though they needed them. However three Defensive Ends were signed in Ridge Wilson, Josh Martin, and Rob Lohr to team with Tyson Jackson (43 tackles /3 sacks) and Ropati Pitoitua (51 tackles /2 sacks). This group only reached the quarterback 5 times in 2012. Horrible. Kansas City was 27th against the run last year and the only interior lineman returning is Dontari Poe. He needs to push the pass pocket more as he didn’t record a sack last year. Along with the offensive line this will line will have open competition with a new coaching staff. They will need to sign another DT or two this summer. Until then, this group is definitely below average. Justin Houston is a wrecking ball of a linebacker, and at 23 years of age, has just scratched the surface. Linebckers: Here is where the Chiefs bread is buttered as a defense. Long time Chief Derrick Johnson turned in a career year with 125 tackles 2 sacks, and 4 passes defensed. 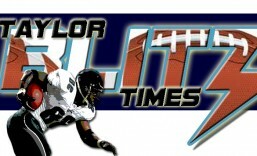 He will bring the thump as he also forced 4 fumbles in a Pro Bowl year from his inside linebacker position. If the Chiefs switch to a 4-3, he would flourish as a sideline to sideline defender. We have to wait and see. 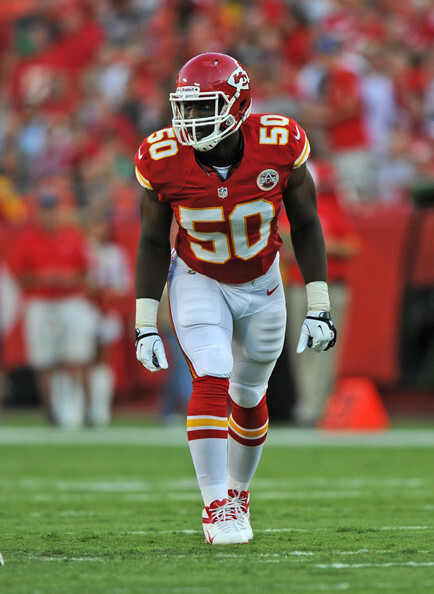 However a switch would be detrimental to Justin Houston’s game. He was the best pass rusher on the team from his outside linebacker flank as he recorded 10 sacks to go with his 66 tackles. He can always rush as a nickel defensive end. At 23 he’s one of the active young defenders that can be built around. When he replaced Von Miller for the 2013 Pro Bowl, the Chiefs sent THREE linebackers to Hawai’i. Yikes!! Tamba Hali is the Pro Bowl linebacker for the second time in as many years. He had another solid season with 51 total tackles and 9 sacks. He’s turning 30 this year and if the team moves to a 4-3 he can go back to a right end position on the line. As of now this is a Super Bowl quality set no matter how they line up for Kansas City. Secondary: This group had mixed results in 2013 that may be more of a result from being constantly behind than their ability to play football. On one hand this group only garnered 5 interceptions the entire year. That’s awful. Yet if you think about it, teams could pass whenever they wanted to and weren’t forced to based on their porous 27th ranked run defense. Yet this group did send SS Eric Berry to the Pro Bowl after an 86 tackle, 1 interception, and 10 passes defensed campaign. Eric Flowers led the team with 3 interceptions to go along with 48 tackles. Gone is underachieving CB Javier Arenas who was traded to Arizona for a fullback. A curious move that alleviated cap room if they cut the fullback instead of Arenas. Good move for cap space but that leaves journeyman Stanford Routt (21 tackles /2 ints) to man the nickle position. They did sign former CB Dunta Robinson, formerly of the Falcons and Texans, to man one corner spot opposite Flowers. Despite their interception totals, Chiefs brass feels the move for Robinson is an upgrade at the corner. They don’t need that much improvement as they were 12th against the pass last year. If this team can generate some offense and play with a few leads they will be more productive. They’ll improve to be an average secondary from being a bad one. 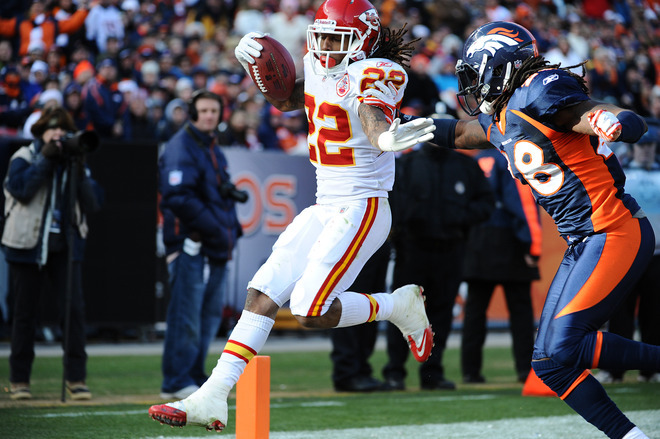 McCluster will be a wild card for the Chiefs this year. Both as a 3rd down back and slot option and a special teams return man. Overall: Once you look at the sum of the parts on this roster, you’ll notice this offense is just in need of a catalyst at the quarterback position. Recent drafts have brought the receivers and two productive running backs and what type of message is team brass sending by releasing an under performing starting tackle and signing five offensive linemen and drafting two others?? This spirited competition on the offensive line this summer looks like the tonic this team needs to get off to a good start. They are on the road in Jacksonville then come home to host Dallas, before the Andy Reid Bowl in Philadelphia in week 3. If the Chiefs can go into that game 2-0 and come out of it either 3-0 or a good looking 2-1, this team will be off and running. Reid has never had these big receivers to run the middle routes necessary to make his offense go. He was short circuited in Philly by fleet receivers who wouldn’t. When he did have bigger receivers they were older players on their last leg. When he had a prime receiver in Terrell Owens, he made it to the Super Bowl after three other trips to the NFC Championship Game. Are we saying he’ll make it that far in 2013?? Take a look at the open competition on the offensive line. Add to that a quarterback who wants to prove himself after being discarded in San Francisco. Now take an offensive minded coach wanting to prove he is still among the league’s elite coaches after being let go in Philadelphia. No shortage of motivational talks and a team that most wont be prepared to play. This team will challenge and may take the AFC West Title. A 10-6 record or 11-5 record will come from a team few see coming…however The Chancellor does. This entry was posted in 2013 Team Previews and tagged Alex Smith, Andy Reid, football, Jamaal Charles, Justin Houston, Kansas City Chiefs, NFL, nfl football, sports, Tamba Hali. Bookmark the permalink. Nice analysis! Need Baldwin to step up big time….so far, disappointing. Charles is dynamite and Smith should be the catalyst to pull it all together….with help from an improving O line. Thanks… Chris just had to take stock in the pieces that are in place. Some people don’t know how close some teams are. With the addition of Alex Smith and Andy Reid’s offense, Jonathon Baldwin should get open. Andy manipulates a defense as well as anyone. Just remember the interception in the Super Bowl by Kaepernick was followed by a diving near interception by C. Williams at the Niner 20 that threatened to blow the game wide open. It did slow comeback efforts. Thanks Fantasy… I seee a lot working for them this year. Nice piece on the new and improved K. C. Chiefs..
Wow! 11-5, That is sticking the proverbial neck out. I don’t see it, but the Chancellor is right more than not so we shall see. Also I get tired of hearing how Kapernick threw ONE MEASLY int. in the Superbowl. It wasn’t especially egregious and certainly not at a critical juncture of the game. Many Superbowl QBs wish they could say the same thing.